33mm white ceramic case,stainless steel bezel with set with white diamonds, white dial, quartz movement, white ceramic bracelet. 33mm white ceramic case, white dial, quartz movement, white ceramic bracelet. 33mm white ceramic case,stainless steel bezel with set with white diamonds, white dial, quartz movement, white ceramic bracelet set with diamonds. 33mm white ceramic case, white dial with white diamond hour markers, quartz movement, white ceramic bracelet. 33mm white ceramic case,stainless steel bezel with set with pink sapphires, white dial with white diamond hour markers, quartz movement, white ceramic bracelet. 33mm white ceramic case, white dial with pave diamond center and diamond hour markers, quartz movement, white ceramic bracelet. 33mm white ceramic case, 18K rose gold bezel, white dial with white diamond hour markers, quartz movement, white ceramic bracelet. 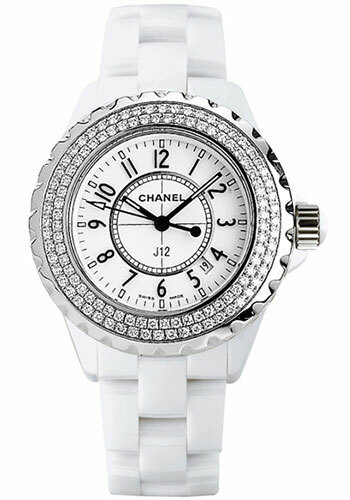 33mm white ceramic case, mother of pearl dial with white diamond hour markers, quartz movement, white ceramic bracelet. 33mm white ceramic case, stainless steel bezel set with 24 white diamonds, mother of pearl dial with white diamond hour markers, quartz movement, white ceramic bracelet. 33mm white high-tech ceramic case, solid back, white ceramic bezel set with 53 white diamonds, white dial in 8 white diamonds indicating hours, along with four arabic numerals, quartz movement with hours, minutes, seconds, white strap, ceramic bracelet. Water resistant to 50 meters. 33 mm white ceramic case, titanium back, brilliant-cut diamond crown, 18K white gold bezel with 34 baguette-cut diamonds, white dial with 12 baguette-cut diamond indicators (~ 0.41 carats), quartz movement with hours, minutes, seconds, white high-tech ceramic bracelet, titatnium triple-folding buckle. Water resistant to 50 meters. 33 mm 18K white gold case with white high-tech ceramic, titanium back, 18K white gold bezel with 36 baguette-cut blue sapphires - 6.1K, white dial with 12 diamond indicators, quartz movement with hours, minutes, seconds, approximately 42 hour of power reserve, white high-tech ceramic bracelet, triple-folding buckle. Water resistant to 50 meters. 33mm white high-tech ceramic case, solid back, white ceramic bezel, white dial with arabic numerals, quartz movement with hours, minutes, seconds, white strap, ceramic bracelet. Water resistant to 200 meters. 33 mm white ceramic case, screw-down crown, unidirectional rotating bezel, white dial with blue luminescent numerals, quartz movement with hours, minutes, seconds, date, approximately 42 hour of power reserve, ceramic and steel bracelet, triple-folding buckle. Water resistant to 200 meters. 33 mm white ceramic case, screw-down crown, unidirectional rotating bezel with indicators on the flange, white dial, quartz movement with hours, minutes, seconds, date, ceramic and steel bracelet, triple-folding buckle. Water resistant to 200 meters. 33 mm white ceramic case, screw-down crown, unidirectional rotating bezel with indicators on the flange, white dial, quartz movement with hours, minutes, seconds, date, approximately 42 hour of power reserve, ceramic and steel bracelet, triple-folding buckle. Water resistant to 200 meters.